With a discography reading like a handbook for the rum and uncanny, electronica mainstay Kelpe is an obvious graduate to the Team Acre associated university of drum wrong and Mutant Fuzz. 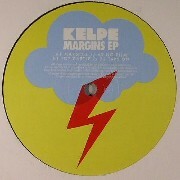 Here teaming up with multi talented human rhythm machine Chris Walmsley (Voice of The Seven Woods, Broadcast, Psapp etc) Kelpe brings an EP that balances deftly between the sound of yesterday and tomorrow. Margins is a wriggling slice traditional drum funk. The steady gallop is haunted by holy ghost rousing keys, zap anomalies and unearthly guitar work. No Film is a moody and low-slung drum excursion. Intricate rhythms provide the solid foundation for unsettling synth-work and fragmented stabs of citric sound. Toy Castle is pure bounce, the pounding kicks push the soundscape through the dance which the sonic scenery is littered with hidden artifacts. The final excursion here it a trip to the lab with Taps On. Initially the most soothing of the bunch giving nods to Dilla or ATCQ more soulful offerings. Taps On continues it's journey through cut n paste territories and rhythmic breakdown. All together a potent brew of electronic voodoo.